A couple of scenic hours from Austin, San Antonio, Corpus Christi or Houston is a quaint and peaceful little city of Cuero, Texas. This little gem is the perfect day-cation, weekend getaway, or excursion, next time you both visit one of its major neighboring cities. There’s so much to see and explore and so many kind and gracious people to meet, that Cuero is worthy of an extended three day weekend visit. If you and your mate like nature and the outdoors, take note that Cuero is The Wildflower Capital of Texas. With the Guadalupe River meandering around Cuero there are endless opportunities for rafting, kayaking, paddling, fishing, and picnicking. We were so glad we lodged just 1.5 miles from the river at Los Robles Ranch House. A secluded and romantic, peaceful, private hub it afforded us the perfect spot from which to enjoy our Cuero adventures. 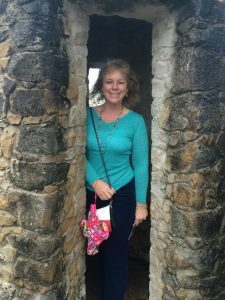 One of the most immaculate yet homey and comfortable vacation rentals we had ever experienced, we were in heaven with a peaceful, country porch where we could enjoy the local birds and critters. The spacious back yard and safely fenced grounds had a lovely picnic and barbecue area. We were thoroughly outfitted with a wonderful selection of books and movies. The bedding was luxurious and nurturing in spacious bedrooms. It was decorated with adorable wall hangings and decorations to make us feel totally at home in our little abode. And our gracious hosts left yummy home baked treats and snacks along with a complete breakfast in the kitchen. We could not have felt more welcome and pampered. 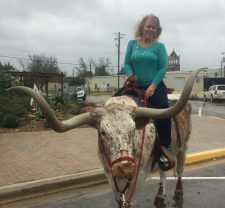 A few of the many highlights of our Cuero visit, for us, were the Pharmacy and Medical Museum of Texas and the Chisholm Trail Heritage Museum. The Pharmacy Museum was spectacular and is being beautifully restored. Depicting the early life of Texas through generations of soda machines, antique postage machines, veterinary medications of the 1800’s, musical instruments and phonographs, historical novelties, and a whimsical collection of Chopper Hopper’s on loan from the town historian Wayne Addicks, these are only a few of the things that will captivate and amuse visitors. 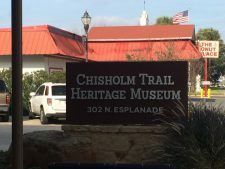 We loved The Chisholm Trail Heritage Museum. This is yet another town gem where you can nearly experience the thousand mile journey of men, horses, and Longhorn steer while gaining an appreciation for ranching heritage, Mexican Vaqueros, South American Gauchos, and American Cowboys. A few steps from the door, you will find the perfect place to enjoy a romantic picnic in adjacent George Bishop Park. After a few hours in this spectacular museum which rivals the Oklahoma City Cowboy and Western Heritage Museum with its spectacular, quality exhibits, you will have a deeper appreciation for the history of the area. Don’t forget to take a driving tour of the magificent, historic Edwardian, Victorian, Mediterranean, and Craftsman homes peppering the town of Cuero. These magificent historical wonders are steeped in historical significance to both the local area and to the state. Spectacular historic churches with outstanding craftsmanship and heritage are found throughout the town and surrounding areas. Nearby Myersville, Gonzales, and Goliad are just a few neighboring areas that are worthy of a visit. Over 50 historical structures are on the National Registry of Historic Structures in the Cuero area. 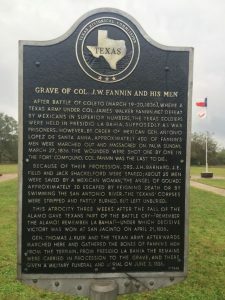 Cuero’s unique and fascinating history stems from many roots including the Turkey Trot of yesteryear and you’ll want to spend some time at the at the Cuero Chamber of Commerce and Visitor’s Bureau to gain a deeper appreciation for why locals are so profoundly proud of their seasoned heritage. 2167 Reamers from around the world are on display, from countless countries, as a result of historian Wayne Addicks’ generosity and mind-boggling knowledge and appreciation for local and world history. A local heritage museum, and other revolving collections and exhibits depending on the time of year, are also at the Chamber and Visitor Center, along with the friendliest and most helpful staff who will help you plan your Cuero visit right down to every detail. The town even boasts an impressive Performing Arts Center that is currently under construction. You’ll find shopping in adorable boutiques, golfing, birding, fishing, and fine dining are some of the pastimes to enjoy in Cuero. 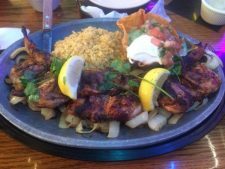 When it comes to dining, Eagle Ford restaurant was our favorite meal in Cuero but lots of eateries are available to try as well as authentic Mexican food. For delectable and healthy snacks you’ll not want to miss Cuero Pecan House for the highest quality pecan delights. And you will want to take some for your roadtrip home. Take a little time to browse at the Emporium and at Wagner’s Hardware but don’t miss the other adorable boutiques, wine, furniture, antique shops and kitchen stores. Many folks find that Christmas is a magical time of year to visit. With Main Street’s extended hours and Christmas in Downtown, a faux ice rink, an unforgettable, top-notch lighted driving display, Christmas in the Park, and an exciting photo opportunity to sit atop Santa’s Longhorn, there’s plenty to make your holiday happy and bright. October is the Turkeyfest Celebration and of course April is the Wildflower Month Celebration. No matter when you choose to visit, Cuero is a fabulous day trip or destination that will leave you with wonderful travel memories, another favorite place to revisit, and new friends to cherish.